Well, the last half of the month sort of… sucked. I screwed up my pill regimen, figured that out just in time to get sick, which turned into a sinus inflammation that had the exact shape of my left maxillary sinus sticking out of my face like an illustration in a text book. You know, I have never been more than vaguely aware that I even have maxillary sinuses. When I’ve had sinus problems before, it’s always been the frontal ones (the ones up behind your forehead). I’ve been calling it a “sinus infection” but apparently very few such inflammations are bacterial in nature (though as with many problems, antibiotics are overprescribed); the swelling and pain were at last brought under control with a stupendous yet apparently medically sound amount of ibuprofen. I’m on mucus thinners now to aid in drainage. I slept most of the weekend, after not sleeping for most of the week before. A couple of things added to a turbulent end of month. One is that someone took it upon themselves to put up flyers declaring Friday the 28th trick or treat day around our neighborhood. Official municipal trick o treating is on Halloween itself this year, as in most years. In order to make sure no one went home disappointed, we decided to be prepared for both nights. So I was prancing around in my shadow costume with half my face swollen under the mask for a grand total of five children… though two of the parties specifically told us that they were glad we were open as we were always their favorite house, so I’m filing it under “worth it”. Building a reputation as the cool house for Halloween is a year-to-year endeavor. Repeat business is key. At the same time this has been going on, our landlords/my parents-out-law have been having a series of computer misadventures. I’m their (paid) tech support, plus they’re family, and I enjoy having technical puzzles to solve. Still, there’s only so many hours in a day, you know? It’s all got to come from somewhere. Being laid up in bed without enough energy or concentration to do much more than tweet crankily turned out to be good for business in one way: someone at The Globe and Mail saw one of my tweet threads and commissioned an op-ed based on it. For those who aren’t aware, that’s Canada’s largest newspaper in terms of readers. Still pretty exciting, even though “Canada” and “newspaper”. I’ve got a second such commission to fulfill today. I had already planned on beginning to shop around pitches for short non-fiction writing after the election business settles down and I have more space in my head to think. If everything goes to plan, I’ll start with two respectable writing credits under my belt that I didn’t have to go looking for. Tonight is Halloween proper. I have a deadline for my second op-ed piece to meet, my out-laws called the “tech support number” on a ransomware pop-up instead of calling me first, and I need to get the lights and sounds rigged for tonight. So, I have been dragging all week. Brain foggy, body tired, zero creativity. I’ve been really worried that I’m getting sick (Jack was sick last week), but I haven’t had any of the symptoms of a cold. Then earlier today, I glanced at the digital thermometer on my electric tea kettle: 87 degrees. After weeks in the seventies and then the sixties all last week, I had changed my office and sleeping area from summer mode to winter mode… right in time for a mid-October heat wave, apparently. My temperature regulation issues make me very susceptible to heat, but not very susceptible to noticing it. Luckily I had not removed the AC from the window, so the office is cooling down to a usable state as we speak. When my brain cools down a bit, I’m going to figure out how to set up an automated alert for days where the high is 80 degrees or above, because this is not an unusual event for me. Over on his blog, Scott Adams (who reminds us that he is a master persuader, as evidenced primarily by the fact that he managed to convince himself that he is a master persuader) has laid out his case to “un-hypnotize” (as he puts it) anti-Trump voters. His reasoning goes like this: when there’s a difference in what people see in a situation, the people who are seeing an unlikely addition to reality are the ones who are hallucinating. If everybody can see a pink elephant, the pink elephant exists. If even one person doesn’t see the pink elephant, though, it can be chalked up to a mass hallucination. It’s basically an application of Occam’s Razor, and as principles for reasoning goes, it’s not a bad one. So let’s follow Master Persuader Scott Adams a little farther along this garden path. Some people, he notes, look at Donald Trump and see the next Hitler. That is, some people see a fascist strongman rising to power on a wave of hatred and populism. And some people, like he himself, don’t. A Hitler figure is an unlikely addition to reality, so if some people see the danger and some people don’t, then the danger must not be real. He doesn’t see Trump as Hitler, so it can’t be real. Well, color me reassured. Because if I accept this logic, not only am I thoroughly reassured that Trump cannot be Hitler, I must also accept a rose-tinted rearview mirror of history in which Hitler could not have been Hitler. Follow Scott’s logic: some people looked at Hitler and saw a dangerous maniac who would fan the flames of hatred and risk plunging Europe and beyond into a war that would dwarf the “Great War” from which it had so recently emerged. And some people didn’t. Some people saw a dangerous demagogue who would scapegoat whole populations and persecute them to the brink of extinction and beyond if he could. And some people didn’t. I think we can all agree that “patriotic man who wants only the best for his homeland” is more likely in politics than “genocidal demagogue and would-be world conqueror”. So if anyone could look at Hitler back then and not see the unlikely addition to reality presented by Hitler-qua-Hitler, that more extreme conception of Hitler must not exist. At least, not according to the persuasive logic of Scott Adams, Trained Hypnotist. Of course, he might rebut this by saying that a historical case is different, because we have evidence that the popular conception of Hitler existed and now there is no longer any doubt. That’s very nice, but there are two problems with it. One, it still leaves us with the fact that at the time of Hitler’s rise to power, the thing that would have struck a Herr Adams, Meister der Überzeugung, as the “pink elephant” of the situation was in fact actual reality, which means that we cannot in the present situation count on anyone being able to determine what is actual reality and what is an unlikely addition just based on an eyeball declaration. Two, there are still people today who dispute the evidence that Adolf Hitler was anything more than a German patriot who wanted the best for his people. There are people today who still make the same “pink elephant” style arguments against Hitler’s worst excesses and biggest crimes. Scott Adams tells us that if everybody is looking at something big and bafflingly unlikely like a pink elephant, and some people can see it and some people can’t, it’s proof that the pink elephant does not exist. He tells us that it’s always the addition that is suspect, always the people who do not see any evidence of the addition’s existence that are correct. So what do we make of Hitler’s apologists? What do we make of Holocaust deniers? It turns out there a lot of elephants in the world, Scott. That is, there are a lot of things that are big and (to some people, at least) unexpected and showing up in places people would rather not face their existence. Scott Adams’s rubric for navigating a world like this is that if even one person says a thing doesn’t exist, then it doesn’t. It can’t. By that logic… what would we be left with? And who decides what the “unlikely addition” is, anyway? In a battle between flat earthers and everyone else, the flat earthers see a mostly round earth as being the pink elephant. They see no evidence of it, so they can dismiss it, quite correctly, using Scott’s rule of thumb. “But they’re wrong,” Scott might say, “and you could prove them wrong by providing them evidence of _____.” And then that’s the pink elephant. It won’t do, Scott. I’m afraid it’s pink elephants all the way down. The is the worst, sloppiest, and most self-serving example of “consensus reality” I’ve ever seen. As a lens for viewing the world, it dispenses with all the utility of Occam’s Razor by insisting on always shaving at the same angle. And the thing is, I think Scott Adams knows this. I believe his blog post is structured not to “un-hypnotize” anyone, not to “de-persuade” them, but rather the opposite. He’s trying to use rhetorical techniques to lead his readers to a pre-determined conclusion. It’s a very straightforward, by the numbers approach, though it’s ruined by his ham-handed application. Sidenote: I believe that Scott Adams has studied persuasion, but he made the mistake of doing it without studying people, and without any real appreciation for his limits. Nuance and statistical tendencies are liberal myths, after all, just like implicit bias and systemic prejudice. Things either work or they don’t, in Scott-land. That’s Scott Adams, Master Persuader. But clumsy and clueless as his approach is, he’s at least trying to follow some good advice. He starts by proposing a thought experiment. This makes you more likely to accept his premise, because it’s all hypothetical. Few people are going to have a visceral “HECK NO!” reaction to that. He then leads the reader through a series of hypotheticals which are pretty much guaranteed to elicit agreement. By the time he gets to third and final scenario, the average reader’s going to be like, “Yeah, obviously.” It’s not a guarantee that a person who has agreed with you three times will agree with whatever follows, but it doesn’t hurt anything. This is the point where he breaks in to state his (snerk) “credentials”, so that you will see him as an authority. It’s a jarring misstep, as it breaks the nominal spell his opening created. It’s one thing to lay out your credentials on an area of informational expertise in order to give your words more weight, but telling someone you’re a master of persuasion is like daring them to disagree with you, and it usually produces the same result. The next two paragraphs are appeals to what I’ll call the fantasist’s ego and then to intellect. The fantasist’s ego is that special section of the ego that wants everything to be a life and death struggle, that wants the ego’s possessor to be the protagonist of reality. There are real-life supervillains targeting you for mind control, Scott Adams says. You’re in the Matrix, Scott Adams tells you. But don’t worry: he’s not calling you stupid. Even the most intelligent person is susceptible to the mind-bending powers of… GODZILLA. Okay. I should explain to everyone scratching their heads. Scott Adams, Master Persuader, thinks that labeling the shadowy Svengali he imagines is coaching Team Clinton on psyops “Godzilla” is going to make the implication resonate more strongly and deeply with you. Because… Godzilla… is… big? Or scary? Or radioactive? Or the actual hero of the vast majority of the movies in which he appears. Nobody knows where he’s trying to go with this, but the actual effect is to make his claims risible and easier to dismiss. I mean, his set-up is all morpheus.gif “WHAT IF I TOLD YOU THAT HILLARY CLINTON IS” and the punchline is “BEING TRAINED IN PERSUASION BY GODZILLA”. You’d be laughed out of the sub-reddit, Scott. That’s what would happen if you told us that. He could have gone with Svengali or Rasputin, which have the advantage of sounding sinister and foreign to people who don’t know who they are. He could have tapped into the zeitgeist by dubbing the mysterious master of manipulation “Killgrave”, which, again, sounds threatening. But no. He went with Godzilla. Which, okay, Godzilla would be incomprehensibly terrifying in real life, but: nobody’s afraid of Godzilla, not the way they’re afraid of other movie monsters or killers or villains. Godzilla is awesome in the classic sense of the word. Godzilla is too big and too powerful for the human mind to really take in as a threat. From there, it’s all downhill. He’s still following well-worn advice, but following it increasingly badly. He asserts his supposed neutrality on the topic (not fooling anyone, Scott), he mentions his “credentials” again, he tries to bring up an example of a mass hallucination that he thinks most people will agree with (“everybody else’s religion but yours”, basically), but because he does not understand people, he doesn’t realize that this is not going to resonate with the religious. His closing is terrible. He tries again for the “several things you will agree with, and then a conclusion you will thus also agree with”: he doesn’t believe in the tooth fairy or Santa Claus or luck or God, and he doesn’t believe Trump is dangerous. Here we come to the thing that’s really holding Scott Adams back, which is that years ago he wrote a line that struck him as clever and it’s shaped everything about how he interacts with people since then: “When did ignorance become a point of view?” In the battle between the comically clueless Pointy-Haired Boss and Dilbert, it’s a great zinger, but using it as a rule of logic for life requires you to assume that you have an innate ability to tell ignorance apart from real knowledge at a glance. And okay, everybody’s got some of that ability. It’s called critical thinking. But like the saying goes: garbage in, garbage out. If you have any faulty assumptions rattling around in your head, the most logical processes of critical thinking you apply will produce some errors. The less critical you are about your own assumptions, the more often this will happen without you noticing, and the more errors pile up, and you get a feedback loop until you wind up where Scott Adams is, at the point where he’s saying a man who leveraged himself badly in order to open up a series of three casinos in direct competition with each other for no other reason than he really wanted his name to be on the biggest and most impressive one ever built “knows risk management”. At the point where Scott Adams decided that the world divided neatly into True Knowledge (what he knows) and Ignorance (what other people who disagree with him thinks), critical thinking became a fool’s errand for him. And since persuasion, for the short on charisma, consists largely of critically thinking out loud in a way that others can follow, his career as a master persuader was doomed to failure in that moment. Well, there are two major goals for the week that I’m missing on: re-opening Ligature Works to submissions is being delayed pending a streamlined bullet point version of our submission guidelines (I’m not good at distilling things to bullet points, and Jack is laid up with a fall cold), and getting ahead of the schedule on Tales of MU fell apart yesterday when I hit a point of exhaustion in the afternoon. Same thing happened today, which makes me suspect that I’m either coming down with or narrowly fighting off the same respiratory crud. Either that, or I’m just not sleeping soundly because he’s up with it. It’s hard to say. This is not a very productive day, though it’s seen some improvements on RealmLike. I’ve never been sure why, but I can do technical stuff with a lower level of mental engagement than creative things. It seems like it should be the other way around. But there’s now background music, travel circles work with the new map saving/loading, and monsters now have a chance to spawn with random variations (e.g., things like Angry Dog, Small Zombie, Wiry Goblin, etc.) that affect their stats, which is a precursor to similar variations on items, which is a precursor to a generalized magic item system. Getting a headache that’s getting worse. I’m actually going to log off the computer after I post this and get some rest. Earlier in the week, I promised a funny political satire piece. This week has made that difficult to deliver, as the bottom kept falling out of the barrel and nothing much funny was left clinging to the sides. My initial idea was a Grinch/Dr. Seuss-style thing focusing on Trump’s overall character, but I found myself moving from that to things like his debate performance, which led me to ponder the similarity between the debate situation (two passed by, one remaining, and each time he’s said he could have hit harder) and that of a baseball game where there are two strikes, two outs, and it all rides on a single pitch. So, that’s how I came to write (and then record) “Donald In Debate“, a poem in the style of “Casey at the Bat”. My goal in the piece is to address the hateful rhetoric and the pain he causes without making them the joke, which I think is important. It’s a delicate balancing act but I’m proud of how I pulled it off. The RealmLike update went live last night. This morning I patched a few bugs that came up in the overnight session. The server is still live for play. The “home version” will be brought up to date with the test server once I have the tier three Wizard skills/spells in. There is illness in our house, but it’s not mine (yet). This might affect the timing on the Ligature Works issue 2 window opening, but not by more than a couple of days. One of my big goals for the week is to get back on track with having Tales of MU chapters written and ready to go at least a day in advance, which means wrapping up the next chapter (which might close out the current book, or there might be a coda) today. If that goes to play, it will be posted for MU patrons this evening. Colossal RealmLike update is coming up this evening, if all goes according to plan. I smoothed out the last bump with map loading/saving this morning, leaving me free to get back to the thing I was working on before getting sucked down this rabbit hole: making the level 3 and 5 wizard spells. It was specifically a teleportation spell that allows you to set (and return to) “spatial anchors” that led me here. I realized that while my map generation procedures could pseudorandomly create identical maps from the same seed each time, those maps had to be accessed sequentially; if you were in the starting town and you tried to teleport to the fourth level of a dungeon on another continent, the game wouldn’t know what to do. Going from “sequential access” to “random access” meant instituting true saving and loading of maps earlier than I’d planned, and it has turned out to be more complicated than I thought to preserve the web of relationships among maps regardless of which order they were loaded in. But that’s finished, and the spell I was working on when I jumped tracks is now fully implemented. That’s the good news. The bad news is that I’m not sure that I’ll have everything I intended to implement for the wizard finished by close of business day today, but I think I can at least have them tidied up through their current cap of level 3, which is enough for pushing the update out. It’s easier to add to the game in my spare time and with occasional workdays devoted to it than it is to solve giant technical problems in that way, so from this point on updates should be more like they were the first few weeks instead of taking weeks at a time. I’ve got a pretty good roadmap for where to go from here. Once wizards have an equal level cap to the other classes, I’m going to push an update to the downloadable version of RealmLike that not only includes all the new content and advances but enables multiplayer. I’m hoping at that point to get some early access-type sales on it. I’m about a day behind on things I wanted to write this week. I don’t know that I’m going to get any fiction writing done today before I do a creepy October tale on Twitter later tonight; I really want to get the RealmLike update put to bed around 6:30, and I hadn’t planned on still being debugging the map loading this morning. One comment I made in one of my recent posts that has attracted a certain amount of skepticism was my endorsement of a con culture that focuses on safety rather than justice in conflict resolutions. “How can you have safety without justice?” is one typical response. “So justice is a bad thing now?” is another. Well, justice is most assuredly not a bad thing. But justice in the sense of criminal justice or what we might call retributive justice is not the most pressing concern of a convention’s code of conduct, nor should it be the focus of a convention’s safety or security team. Let me put it to you this way: how many comic, literary, or media conventions have you been to or heard of, that you would trust with the weighty responsibility of meting out justice? How many of them do you think have the people, expertise, or time and resources to serve out justice in a meaningful sense? Or to put it another way: imagine you’re in charge of hiring a mall security officer. Assuming you have to take one and not the other, which one of those individuals do you hire to guard your mall? If you take the first one, I can assure you: you’re not going to be in charge of hiring for mall security for much longer. Because that is not the job. Providing safety is a necessary step in almost every human enterprise. It may never truly be complete (safer rather than absolutely safe is the goal), but providing justice is a never-ending battle and something that requires highly dedicated institutions as well as an individual commitment, and even then it often goes horribly wrong. I mean, when’s the last time you heard about a gross miscarriage of safety or a travesty of safety? I certainly don’t mind when a convention has a commitment to justice. My “home convention” of WisCon has such a commitment. But I expect such a convention to be reflected by a striving towards justice, not dispensing it. In recent years, WisCon learned a valuable lesson in the folly of attempting—as laypeople with limited resources—to apply principles of jurisprudence and criminal investigation in resolving conflicts between people. It’s having witnessed this (and part of it up close, as part of WisCon’s ConCom) that informs my view here. People who are saying that a convention should never act on a complaint without performing a serious investigation, weighing evidence, and having a finding of facts culminating in a verdict in a sentence are, whether they know it or not, advocating for one of two possibilities: an endless succession of unqualified kangaroo courts or a world where conventions never act on complaints. Neither approach actually serves justice. Neither approach does anything for safety. Trying to find a middle ground (or create a workable “convention court” system) would place an undue burden on conventions, raising the costs in money and time investment, and for what? To satisfy the aggrieved sense of fairness of random people on the internet, most of whom will continue to side with their friends and assume that any result other than the one that vindicates their own biases is a sign that the system was rigged anyway? I’ll tell you one thing that’s true about this latest case and the one I referenced regarding WisCon: as far as I could tell, neither party ever really disputed the basic idea that it was a good idea for the two of them to avoid each other. Like, that was accepted as just plain a good idea, no matter what version of events you believe or what viewpoint you subscribe to. In a case like that, what is there to investigate? “Feelings aren’t actionable!” cry the people who haven’t noticed that there was no action in the sense they mean it. It’s an interpersonal conflict resolved via boundary mediation, not a criminal complaint resolved via punishment. A convention’s commitment to safety means they will try first to prevent conflict, then to diffuse it, then to resolve it. Punishment, if it happens, is incidental. Even if an action is interpreted as punishing, the so-called punishment is not the point. The harm reduction or risk mitigation is. When James Frenkel was initially provisionally banned from WisCon, to name another case, the outcry was not because he was not being punished enough. Few people wanted him punished more. The concern was safety… not vengeance, not retribution, and not punishment. When the convention elected to permanently ban him instead, this represented (in my opinion, based on arguments made at the time) a shift from “What punishment is appropriate for this transgression?” (a criminal justice-based approach) to “What action is necessary to ensure the safety of our members?” (a safety-based approach). I don’t want to go to a convention that thinks it can force people to be better people through behavioral modification, which is the higher goal of punishment, per se. I don’t want to contribute my time, money, or energy towards a convention that is spending its resources in the foolish pursuit of creating a workable parallel to a criminal justice system. I understand the impulse to go, “Wait, there was no investigation? No trial?”, but man, no one actually wants to go down that path: “In the media convention circuit, people are represented by two separate yet equally important groups: the Public Safety Team who investigate crime and the ConCom who prosecute the offenders.” Is that what we want our conventions to spend their time on? Again, I say: no, thank you. Conventions have a duty to provide a measure of safety. They have neither the duty nor even the means to provide justice. Trying to act as a court system is how they wind up with uneven punishments, complaints that stretch on for years, etc. Your average fandom convention at any one time has got not quite enough expertise, resources, money, logistical support, and volunteer-hours to actually throw a convention in the first place… and then, amazingly, against all odds, they do it anyway. You’re not going to get all that and a criminal court system, too. Well, day 2 out of 5 for the week and I’m checking off one of my minor goal action items already by doing a status post immediately. Look at me go! To give you an idea how out of it I was early yesterday, I actually started my status post right about now and then couldn’t focus to enough to finish it until late afternoon. A lot clearer today. This means I’m more likely to make progress on my bigger goals today. Basically unchanged. Not comfortable, not desperate, not where I need to be. Growing slowly. It’s going to be a busy day. Grocery shopping (you can help kick into our household expenses here, or using http://www.paypal.me/alexandraerin), writing, coding, revising submission guidelines for Ligature Works. Tales of MU coming up tonight. I’m setting myself three major “accomplishment” goals for this week. Get back on track, re: having Tales of MU updates done and posted for MU Patreon subscribers a day in advance of their general publishing. It’s not going to happen for Tuesday’s chapter, but I want to be ahead of the game before Friday. Have a major update for RealmLike available on Wednesday. Open Ligature Works for a ~6-week submission window, starting on Friday the 15th. Write fiction/poetry every day for a minimum of one hour, preferably two or more. Note: This is actual “hands on keyboard” time. Actual time directly spent in the entire creative process is about double that. Write a status post every day. It’s just a good habit and helps keep me on track. Post more often to my author Patreon, so people have a better idea what I’m doing. A lot of times I’ll do something small or incidental and throw it up on Twitter or Tumblr, and not link to it there. Bad habit, no biscuit. One reason I’m getting fired up about writing MU in advance is that I’d really like to attract more patrons there. If I were in fact earning the $66 per chapter that is listed on the page, I’d be in really good shape right now. I mean, I’d still want to build on that. But that’s a livable rate for the work involved. The problem is that it doesn’t reflect the per-month cap that a lot of patrons have on their contributions. And to be very clear: the problem isn’t that people have such caps. If you’ve got X dollars a month you can spend on Tales of MU, I’d rather you do so than feel bad that you don’t have X+Y dollars. I cannot stress this enough. I don’t care if someone caps their contribution at $1 a month. If everybody reading MU who were able to do that, did that, I’d be overwhelmed. No amount of patronage is ever insulting or inconvenient. None. But Patreon’s reported payout-per-chapter is based on all pledges, before caps, which makes it hard for me to do financial planning and maybe gives people an inflated notion of how much money I’m making. When I hit all my chapters for the month, it’s honestly more like $20 or $30 per chapter, averaged out over the month. I’m getting $60 some for the first chapter, more like $15 for the last one. Which, again, I appreciate. But it does a lot less for my motivation to know that each chapter I post in a given month is worth slightly less than the previous one. I try to think of it in terms of yes, but it’s still more money overall. Because, yes, it’s still more money overall. And it’s always going to be true that each chapter brings diminishing returns, because caps. But ultimately, I think it’ll be easier to keep writing as the returns fall if the overall payouts are increasing, even if a lot of the new patrons are capping their pledges at $1, $3, or $5 a month. And even with these complications, I do still think the “per chapter” model is better for Tales of MU than the “per month” model, in terms of fairness to readers and motivation/accountability for me. Crowdfunding a specific work of art works best when the funds are tied to the production thereof, in my opinion and experience. All of this is to say that if you enjoy Tales of MU, you can do a lot for it and for me by pledging a dollar or more per chapter, with or without a cap on charges in a given month. If we get to the point where I actually am making $50, $60, $70 a chapter on average, that’s going to do a lot to keep the show on the road, so to speak. Very slow start to today. I had trouble sleeping most of the weekend, and then got my flu shot on Sunday. I am in an elevated risk group and I have close family members who have even more risk factors, so I always get my shot as soon as I can and I always get the quadrivalent shot when it’s available. Historically, I tend to get joint aches, muscle soreness, and heightened fatigue after a flu shot, and this time was no different. I’ve already done some blogging and tweeting, and made and posted a custom D&D monster. I’m about to start my hour of writing. In Saturday’s game, I threw a group of insectoid bandits at the party. The bandits were a large number of thri-kreen, bulked up a level with the quick-and-dirty CR-increasing method of increasing their attack bonuses and defenses with +2, plus giving them a better multiattack routine. Two of them had mounts that I adapted off the cuff from the existing giant wasp creature in a similar fashion. Oh, I’m realizing as I type this that I based the experience reward for the encounter off the listed CRs and not the adjusted ones. Whoops! That’s a risk of such on-the-fly adjustments. I thought the number I wound up with sounded low for the challenge of the fight. I’ll have to make that right at the start of next session. Anyway. I wasn’t fully satisfied with my wasp adjustment, because the existing giant wasp is a medium creature and one large enough to carry humanoid riders would differ by more than few points’ hit/miss chance. So this afternoon, I’ve taken it upon myself to make a more complete wasp mount write-up. As always, the stat block was created using critterDB. 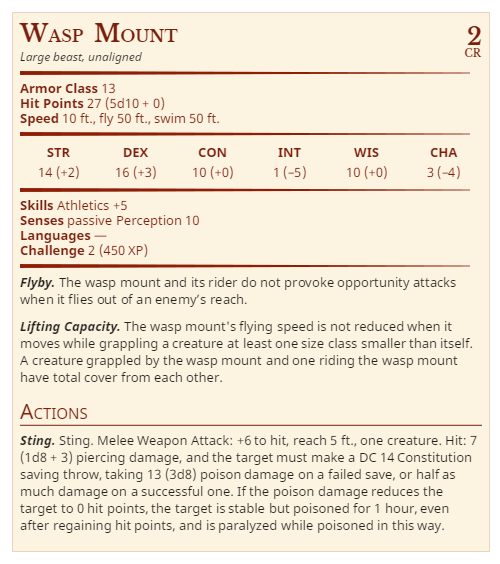 I started with the existing giant wasp and scaled it up a size, increasing its hit dice size in accordance with the guidelines for such and then giving it a few more. I also increased its Strength and the damage dice of its attacks, to reflect is larger size, then upped its Dexterity and proficiency bonus simply because it’s meant to be a more menacing creature than the baseline giant wasp. The added traits of Flyby and Lifting Capacity are simply there to make things interesting. One way to have a good mount is to have a creature that is not particularly dangerous or even that compelling on its own, but which when ridden by another creature almost exponentially enhances its deadliness. A flying mount that can avoid opportunity attacks hits that niche, even before you add a wicked poisonous sting. The “lifting capacity” trait is mainly there for story/non-combat purposes (giant flying wasp abductions!) rather than in-combat uses. As appealing as many people seem to find “drop them from great heights” as a combat tactic, round-by-round it’s almost certainly going to be better to have the wasp and rider make flyby attacks, particularly if the rider has multiattack.